(NKnews.com 10.10.2015) Parade demonstrates party commitment to nation’s defense, shows off some newer equipment. North Korea stands ready to fight any war with the United States and its armed forces are now so strong that the country has become a global military power, leader Kim Jong Un said at major anniversary event on Saturday. But despite the strident tone of his speech, North Korea refrained from carrying out anticipated missile tests to coincide with the event, held to commemorate the 70th anniversary of the founding of the Worker’s Party of Korea (WPK), or a satellite launch that many observers had expected earlier in the year. “Our revolutionary forces are capable of dealing with any kind of war being waged by the U.S.,” Kim said during a 25-minute address prior to the military parade. “Through the line of Songun (military-first) politics, our Korean People’s Army has become the strongest revolutionary force and our country has become an impenetrable fortress and a global military power,” he continued. 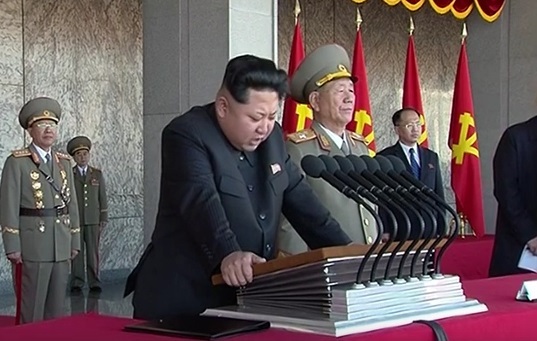 Following Kim’s speech a widely anticipated military parade kicked off, featuring formations of soldiers in various KPA uniforms – including historic versions – among the first to pass by the reviewing stand in Kim Il Sung Square. Being a commemorative event, the approximately two hour parade featured old equipment as well as new, including the T-34 tank, a model which was used in the Korean War. At various points during the parade, light aircraft flew above Kim Il Sung Square in formations, including CJ-6s depicting emblem of the WPK and An-2s depicting the number 70. Among the artillery in the parade were self-propelled multiple rocket launchers (MRL) of various calibers including 107mm MRLs, 122mm MRLs, 240mm MRLs, and the previously unseen (though known to exist due to test firings) 300mm MRLs. Other self-propelled field artillery included 122mm howitzers, 152mm gun-howitzers, and 170mm Koksan guns. The parade featured several armored personnel carriers such as the BTR-60 and M-2010 and tanks such as the Type-59, Chonma-ho, and Pokpung-ho. Notably, there was a lack of any towed artillery in the parade, perhaps intentionally so in order to present an image of a more mobile and rapidly deployable force. The only unmanned aerial vehicle (UAV, a.k.a “drone”) featured in the parade was a previously seen, indigenously produced UAV believed to be based on the American MQM-107. The designation of this UAV, which is mounted on ZIL-130 trucks, is unknown. Following the UAVs were Kumsong-1 (a.k.a. KN-01) surface-to-ship missiles. Three different surface-to-air missiles (SAM) were featured in the parade including the S-125 (NATO reporting name SA-3) and S-200 (NATO reporting name SA-5) and the KN-06, a North Korean version of the Russian S-300. The parade also featured ballistic missiles such as the Scud (Hwasong-5/6), the Rodong-A, the Rodong-B (BM-25 Musudan), and what appears to be a new version of the KN-08 intermediate range ballistic missile (IRBM). Following the missiles, the parade ended with a military band marching in formation to spell out the word “victory” (seungri) and Su-25 ground attack aircraft flying overhead with colored smoke trails. The attendance of China’s No. 5 leader Liu Yunshan at the parade further suggested a thawing of relations between Beijing and Pyongyang, him being the most senior Chinese visitor to Pyongyang since Kim came to power. Video of the parade on Saturday showed Kim and Liu standing shoulder to shoulder on a viewing platform overlooking Kim Il Sung square, frequently talking and laughing among themselves. Chinese state media said Liu brought Kim a message on Friday from President Xi Jinping, extending congratulations and best wishes from Beijing to Pyongyang to commemorate the 70th anniversary. Notably, Kim Jong Un did not mention North Korea’s signature “Byungjin” policy of simultaneously pursuing economic and nuclear weapons development, something some analysts suggested Saturday could be in respect of Liu’s presence. China is opposed to Pyongyang’s nuclear weapons program. The prime-position presence of Liu at the event stood in stark contrast to the distant positioning of a North Korean delegation at recent Victory Day anniversary celebrations in Beijing. At that September 3 event, which Kim Jong Un did not attend, DPRK envoy Choe Ryong Hae stood watching the parade over 40 people away from President Xi. South Korea’s President Park Geun-hye stood adjacent to Xi, reflecting the increasingly close ties between the two countries. Dr. Leonid Petrov, a North Korea researcher at the Australian National University (ANU) in Canberra, told NK News the parade emphasized the regime’s rule and military policy, rather than any hopes of changing inter-Korean relations which were evident in another recent event. This parade appears to have emphasized not only the current state of the DPRK’s military technical capability, showcasing much of its newer equipment, but also the role of the party in fighting for and defending the country – both historically and presently – and the party’s leadership in military affairs. “KJU’s speech and today’s military parade were to convince people inside and outside of the DPRK that after the 70 years of dictatorship and militarism nothing is going to change,” Petrov told NK News.